Various martial arts styles have been developed in countries all around the world. Each of these styles has its own set of techniques. Some fighting systems emphasize strikes while others focus on kicks. Some styles prefer fighting on the ground while others like to remain standing. In a real fight, it is often the simplest martial arts moves that quickly get the job done. Four basic martial arts moves that are found in several styles are the forearm block, roundhouse kick, palm-heel strike and front-elbow strike. 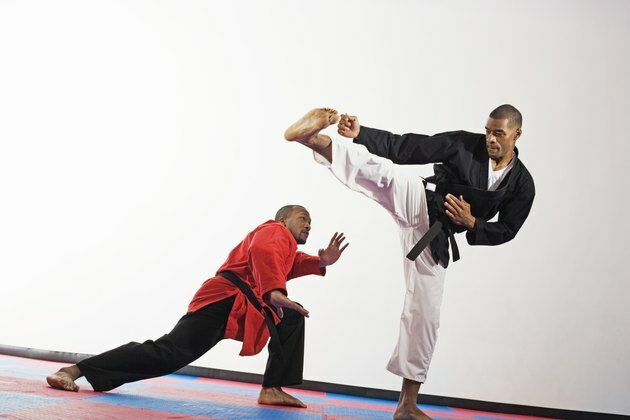 Martial artists often learn a series of blocks to protect themselves from punches and kicks The forearm block is used to deflect an attacker's punch while simultaneously hurting his arm. Perform the forearm block by first pointing your fist at your ear and pointing your elbow to the side. Swing your upper arm across the front of your chest. The outer edge of your forearm should make contact with the assailant's arm. Correct timing is essential in successfully blocking an incoming punch. You can also use the forearm block as a defense against a lapel grab. Use this technique to force an assailant to let go of your shirt. The roundhouse kick is a commonly used technique in martial arts. This kick is especially popular in taekwondo competitions. This fast, powerful technique can be deceptive, and your opponent may have a hard time figuring out where it's going to hit him until it's too late. To perform this kick, lift your leg off the floor and bend your knee. Kick horizontally at your target with your instep or the ball of your foot. Twist your hips and quickly snap your knee to generate power in this technique. This kick is typically delivered to the midsection or head. Raise your knee higher to perform head-level kicks. The palm-heel strike is a basic hand technique that is effective for self defense. You don't need to be extremely muscular or a black belt to inflict a lot of damage with the palm-heel strike. Execute this technique by forcefully driving the heel of your palm at your target. Hit an assailant's nose, chin or jaw with this strike. This technique can break an attacker's nose and cause his eyes to water. Martial artists sometimes prefer this strike over punching because damage to your own fist and wrist can occur while punching an assailant's face. Martial artists don't just use their hands and feet to fight. The elbow is also a devastating weapon. Fighting styles such as krav maga, wing chun and muay thai often use elbow strikes for close-range combat. Deliver a front elbow strike by bending your arm and swinging your elbow horizontally at an assailant's jaw. Increase the effectiveness of this technique by grabbing the back of his neck or head and bringing him into your strike. If you lower your stance, you can also deliver a front elbow to the attacker's ribs. What Does a Karate Chop to the Side of the Neck Accomplish?